There was a scene in The Incredibles where Edna Mode is talking to Bob about fixing his costume. The scene called for Edna to stick her finger through a hole in the costume. On the DVD commentary, Brad Bird explained that this was functionally impossible to do in Digital Animation prior to this movie. Pixar literally had to invent the technology to do it. Cut to 7 years later, Disney/Pixar’s Brave has set the bar for computer animated films, a movie so detailed and fluid that it will blow your mind. When you get right down to it, Brave is an achievement so stunning as to take one’s breath away. Pixar has always had an eye for great storytelling. It’s what they’re known for. 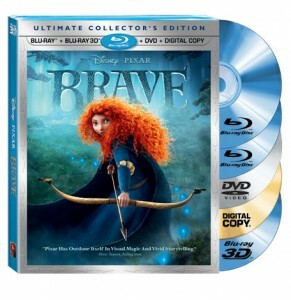 With the release of Brave, however, they have taken it to another level. Brave is the story of Merida, a Scottish princess who is not content with tradition. She is more a warrior at heart than a prim and proper princess. Much has been made of Princess Leia (Star Wars) being the new tough gal in the Disney Princess roster. Merida could take her. In fact, she might give a certain red haired fox a run for his money in the archery department. When Merida is forced by tradition to marry one of three suitors from local clans, she refuses. In the face of impending war, her mother Elenor fights with her to change her mind. When Merida meets a witch who promises to change her fate, Merida’s choices may doom all of Scotland… and her family most of all. The story works on so many levels. The characterization works so well. Each personality is distinct and fully developed. Merida is completely believable as this firey teenager. Just listen to the way she says “Mom! It’s just muh BOW!” Elenor is a woman who is torn between duty and her frustration and love for her daughter. When she moves back and forth between those emotions, you follow with her through that journey. But perhaps best of all is Merida’s 3 brothers. The roles are completely silent, yet you know exactly who they are within moments of meeting them. All of their story is told visually and it is completely effective. The second, and more impressive element is the animation. Think about the previously mentioned problem in Incredibles. Then watch through this movie. 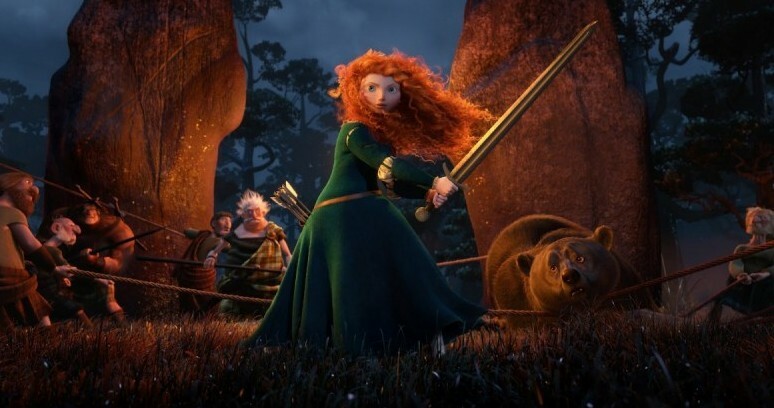 Look at the fluidity of Merida’s hair or the fur on the bear which can be counted strand by strand. There’s an early scene with Merida at a waterfall as it flows through her hands and a mist spreads around her. Many of the environments in the movie actually look real. The fact is that every single frame of this film has an attention to detail that defies description. You could literally turn off the sound and appreciate it just for the art. There truly is a lot to appreciate. As an admirer of Scotland, their handling of this proud people was welcome. The highlands aren’t just a backdrop. The filmmakers managed to find the humor in Scottish culture while still respecting it. They also used many actual Scots for the voice acting. Billy Connolly, Kelly MacDonald, Kevin McKidd and Craig Ferguson all occupy main roles. My only disappointment was that Karen Gillan (Doctor Who) wasn’t brought in. Looking back, this is the first film released in a very long time that has felt like a classic Disney story. All the classic elements are there: an impetuous Princess/ heroine, a witch, a curse, true love and family. (Admittedly, I am cheating with the “true love”.) It fits right in next to The Little Mermaid, Aladdin or Beauty and the Beast. All that is really missing is a musical soundtrack. It even makes you wonder what a true Disney- Pixar collaboration might produce. Perhaps one day soon, we may find out. Brave is on sale now in DVD and Blu-ray.